The South End’s SoWa District continues to thrive as one of the city’s most vibrant restaurant destinations. Here are just a few of the local one-of- a-kind casual dining options that the residents of 88 Wareham can enjoy. 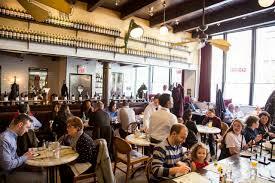 Nestled in between historic brownstones, The Buttery in the South End is frequented by many of the locals. This neighborhood favorite has been serving since 2005. By day it serves as a busy bakery/café with a dog-friendly patio. It’s a great place to people watch while you sip on a cold brewed coffee and enjoy a slice of ricotta toast with hazelnuts and honey. At night, they offer classic comfort food, craft cocktails, wine, and beer. Dine on the patio, the garden level dining room, or next to the fireplace. The South End Buttery touts their establishment as one of the best casual dining values around. Stella is one of the most beautiful restaurants in the SoWa neighborhood, designed with white-on-white décor and floor to ceiling windows. This chic place is known for being consistently terrific with a lovely staff who delivers delicious contemporary fare minus the high prices and attitude. In operation for over 10 years, Stella is filled almost every single night. Before the summer is over, indulge on a “Watermelon 2 Ways” cocktail while on the outdoor patio with a side of crispy truffle parmesan fries, or sit inside the dining room or bar and sample Stella’s homemade braised short rib gnocchi. If you sit outside, you are encouraged to invite your pooch. Gaslight Brasserie is a South End French staple, known as the friendly and affordable brassiere we all wish we had in our neighborhood. It is located in one of the many wonderful old buildings that line Harrison Avenue. The interior space is rustic and charming, with mosaic tiles, a wood beam ceiling, and an old wooden floor. Patrons can also enjoy dining on the dog-friendly patio offset from the street. Gaslight diners can choose from a large selection of classic French brassiere cuisine with daily specials. Mondays feature Coq au Vin while Tuesday offers Boeuf Bourguignon. For something light, enjoy pate with a selection of artisanal cheeses, accompanied by locally baked French bread, and one of the 20 variety of French wines by the glass. Cinquecento Boston is a comfortable and friendly South End gem that is a perfect spot for a spontaneous night out, or as your go-to spot for a casual dinner. 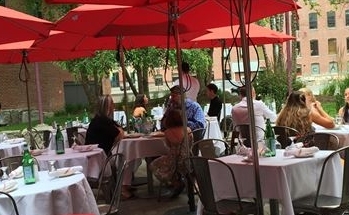 This Roman trattoria’s reputation for providing consistent delicious food and a friendly staff is complemented by the 60-seat outdoor patio. The patio is in its own courtyard surrounded by sculptures, greenery, and flower beds away from the street. The patio is heated for the cooler nights. Enjoy dining al fresco on classic dishes such as bucatini carbonara topped with cured egg yolk and cured pork, grilled octopus, and fresh burrata. There are more dining destinations to enjoy. These are just a few.